Socceru Main – Skip the first 40 seconds of each video. Video #1 SoccerU – Before you start. Video #2 SoccerU – Setting up touch stations. Video #3 SoccerU – Touch stations one by one. 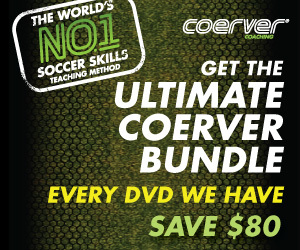 Video #4 SoccerU – Working ball control into dribbling. Video #7 Dribbling with pressure. Video # 14 Receiving with pressure space with touch. Video #15 Advanced Receiving and touches. Video #26 Moves and field work. Video #33 Vision and heads up. Video #36 Always move always be an option. Video #38 Fixing the soccer kick and adding power. Video #41 Deceptive moves and fake shots.